Black bean soup had been on my mind for quite some time. I had seen delicious versions at Noob Cook and at A Southern Grace, and I kept thinking about how I needed to buy a big bag of beans and make some soup. I finally did that and used some of those beans for tostaditas as well. This particular black bean soup is from Vegetarian Cooking for Everyone , and it’s very much just about the beans themselves. It’s a simple soup with no spicy edge and minimal garnishes, but it is pointed up with Madeira and enriched with cream. Sadly, it’s not a very pretty-looking soup, but I seem to have a knack for cooking up unphotogenic bowls of goodness. To begin the soup, onion, celery, carrot, diced green bell pepper, bay leaves, chopped rosemary, and thyme were sauteed in butter. Tomato paste was added and briefly cooked before the beans were placed in the pot and covered with water. This was left to simmer until the beans were tender. Salt was added, the bay leaves were removed, and then two-thirds of the soup was pureed. The puree was added back to the pot and stirred into the remaining soup. I liked this result of varied textures with some thickness from the puree and some whole beans. At this point, a half cup of Madeira and a half cup of cream were added. I served the soup with a little crema and some chopped parsley. I, of course, love black beans prepared in a southwestern style with lots of fresh and dried chiles, but this simpler approach was a nice change of pace. The herbs and vegetables provided a foundation for the flavor of the beans, and the Madeira brightened it up. Naturally, cream never hurts a dish, and here it made the puree seem even smoother. 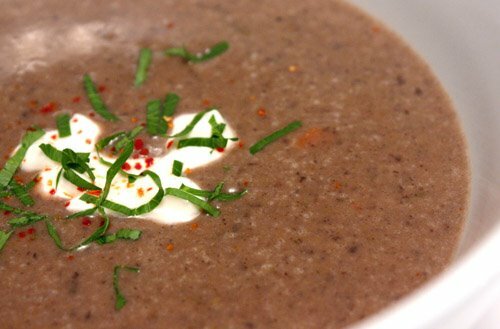 It sounds so basic because it’s just black bean soup, but this is surprisingly flavorful and filling and deliciously so. I really like using black beans in soups like this. They are so creamy and good! Beautiful soup..really lovely with your garnishes. Yum. 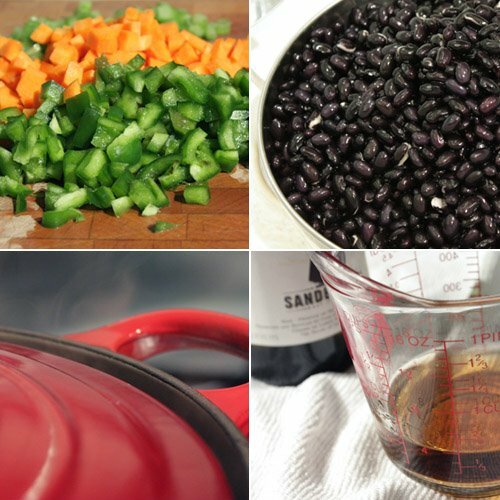 I have had black bean soup on my list to make for so long!! I need to get cracking! I think it looks delicious and you managed to make it look pretty too with those garnishes. I just had gnocchi with portobello the other night and I could NOT get a decent photo. It must be the gnocchi! ;-) Enjoyed the post! Of course a dollop of cream doesn't hurt. Delicious. I think soups are very difficult to photograph - I can't seem to get a good shot. You did a terrific job here. I made that recipe once long ago and really liked it. Mmmm...black bean soup with a dollop of sour cream add some tortilla strips. I'm sold. Delicious! Hahaha true, black bean soup isn't very photogenic, but anyone that has tried it (or has a vivid imagination) can tell it's delicious!!! This one in particular looks great! This looks interesting...I haven't tried black beans on soups before..
You did a terrific job with the presentation of this soup! Gorgeous! Mmmm Mmmm Mmm. creamy, silky & beautiful ..of all the beans, i thinks the black bean has the best earthy texture & flavors! Wow! I wish I had a bowl of that right now! What a beautiful bowl of soup! Black bean is SO good and yet completely unphotogenic - I think you did a great job with it though! I love your version, it looks so good! What a healthy & beautiful soup of pure goodness! Delicious & tasty looking, Lisa! Mmmm! This soup looks thick, rich, creamy and delicious! Black bean soup is one of my favorites! I love how some of it is pureed - it looks very creamy and delicious! I made the chinese blk bean soup after seeing your post. I would love to try your version one day but have to get the right black beans first. I love black bean soup, especially southwestern. This recipe looks so good! 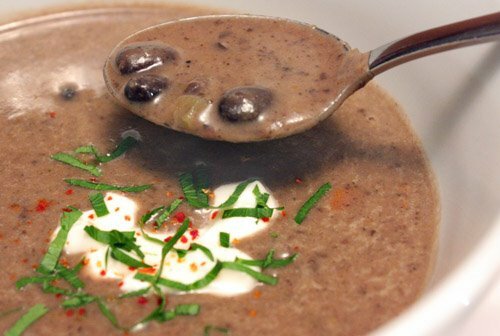 Madeira in black bean soup is such a great idea. I have never added booze to bean soup before, but now that I think about it, it should work. I love a good black bean soup and your's looks delicious! Looks so good! Black bean sou pis always so comforting and delicious! I don't think I have ever seen a black bean soup getting the madeira and cream treatment, sounds good! "Naturally, cream never hurts a dish"
Oooo - the additions of Madeira and cream sound wonderful! I can't express how much I adore black beans and as far as I'm concerned, this soup is picture perfect! Black Bean Soup is amazing, even if it's not very photogenic! Yours sounds delicious. Thank you for the mention xo ... I think your version looks so much more delectable than mine. I just love creamy soups!